In organisms consisting of multiple cell types, diverse cells with different functions and structures develop as we grow and age. The organization and variability of these cells have a profound impact on the function of different tissues, process of aging, and emergence of diseases and conditions. Recently developed technologies are allowing researchers to explore cells on the individual (single cell) level and provide an opportunity to establish a census of cells in human tissues and to study functional interactions among single cells. 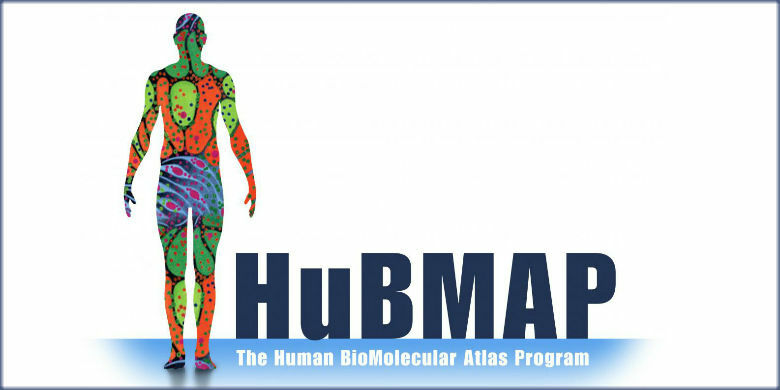 The Human BioMolecular Atlas Program (HuBMAP) aims to facilitate research on single cells within tissues by supporting data generation and technology development to explore the relationship between cellular organization and function, as well as variability in normal tissue organization at the level of individual cells. Supporting pilot projects that demonstrate the value of the resources developed by the program to study individual variation and tissue changes across the lifespan and the health-disease continuum. This program is funded through the NIH Common Fund as a short-term, goal-driven strategic investment, with deliverables intended to catalyze research across multiple biomedical research disciplines.The NIH Common Fund supports cross-cutting programs that are expected to have exceptionally high impact. All Common Fund initiatives invite investigators to develop bold, innovative, and often risky approaches to address problems that may seem intractable or to seize new opportunities that offer the potential for rapid progress. The HuBMAP Consortium will scale-up the range of tissues, technologies, data management and its community engagement activities throughout the duration of the program. Transformative Technology Development-This set of initiatives, the first of which was issued in FY2018, seek to establish proof-of-principle with initial validation of transformative new tools, techniques and methods for mapping the human body at high resolution. Rapid Technology Integration- This set of initiatives, which starts in FY2019, will focus on enhancing, large-scale validation, and integration of emerging new technologies into the HuBMAP Consortium. The goal is to improve the quality and throughput of atlas generation at key steps of the production pipeline including sample collection, tissue mapping, and data integration and analysis. Tissue Mapping Centers- These Centers, initially funded in FY2018, will build, benchmark, standardize, validate and generate extensive data from high-content, high-throughput imaging and omics technologies to produce 3D human tissue maps at high resolution. Centers will be expected to integrate and optimize all parts of the data generation pipeline, from tissue collection and preservation through to data integration, analysis and interpretation. The HIVE - This multi-component collaboratory, funded in FY2018, will have responsibility for: 1) managing the data generated by the Consortium, 2) coordinating internal and external Consortium activities, 3) developing novel tools for visualizing, searching and modelling data and 4) building an atlas of tissue maps. Demonstration Projects- The goal of this initiative, which is expected to start half way through the program pending the availability of funds, is to demonstrate how HuBMAP resources, in combination with new or other datasets or biospecimens as needed, can be used to build better statistical and analytic tools and models of cellular organization and communication in tissues. Learn about NIH HuBMAP funding opportunities, news, and resources as they become available by signing up for the HuBMAP listserv here. NIH staff will hold the pre-application technical assistance webinar for the Rapid Technology Implementation funding opportunity (RFA-RM-19-002) 1-2pm EST on January 30, 2019. Please sign up for the webinar. The slides for the RTI Technical Assistance Webinar are here.